Buy to let lending reached £25 billion at the end of 2014 - a 25% increase on lending in 2013 according to Mortgages for Business, the specialist mortgage broker. It also says that nearly three in five landlords expect to expand their portfolios over the next six months and 64% of those looking to expand will need to refinance in order to do so. The research also found that 59% of part time landlords say they will need to refinance to fund their expansion while 72% of professional landlords will need to refinance. Both veteran and novice investors will be able to discuss a range of Buy-to-Let purchase, remortgage, bridging and refurbishment loans from a selection of the UK's leading specialist lenders. 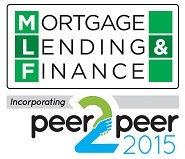 Peer to Peer finance matches individual borrowers or companies with savers seeking a good return. Borrowers can achieve lower rates, while savers can achieve improved rates. This was a hot topic at our 2014 shows – and the thoughts of contributors from Funding Circle, LendInvest, CrowdProperty and LaunchPad PLC can be seen on this short video (click here)... and with the industry now FCA regulated it’s popularity is set to grow further. Whether an investor is purchasing their first Buy to Let property or is a seasoned investor expanding their portfolio, the risks need to be carefully considered. The keys to a successful Buy to Let investment are to choose the right property and plan finances accordingly. Find out more about the Nat West range of Buy to Let mortgages and other services at Stand 435. LendInvest are re-inventing the mortgage. Their aim is to change the whole concept of a mortgage - from how you get one, to how mortgages are funded. Getting a mortgage in the UK is a painfully slow process. It is a process that is full of bureaucracy and paperwork - and more often than not, a bank’s lending criteria doesn’t seem to make a lot of sense. LendInvest are creating a process that is easy to understand for borrowers, and a platform that gives everyday investors the ability to invest in a mortgage. Up until now, investing in a mortgage has been the exclusive domain or large institutions and hedge funds - LendInvest changes this. Aldermore are buy to let specialists, offering mortgages for new and experienced buy to let landlords. So whether an investor is just starting out, looking to expand a portfolio, or remortgaging – Aldermore is the right place to start. They offer a full range of variable and fixed rate Buy to Let mortgages with a personal service that`s second to none. And, as you`d expect from Aldermore, all products are backed by refreshingly sensible underwriting rules and criteria, applied by real experienced people. Shawbrook is committed to helping property investors grow their portfolios. They are a specialist savings and lending bank, offering a straightforward, non-nonsense alternative to the high street. Shawbrook`s range of products has been designed specifically for UK professional investors that are looking for short or longer term funding against a range of residential, mixed use and commercial property assets. Shawbrook believe they have one of the most rounded investor propositions in the market. They understand just how important it is for investors to partner with a lender that can deliver competitive pricing alongside quick execution. FBN Bank (UK) are the London bank for Nigerians - either resident in the UK or simply visiting. They also offer expertise in all West African countries. FBN Bank (UK) recognises that property is an important element of their clients' wealth, whether in the form of second homes or property abroad. While property presents the opportunity to make significant returns, the sector is not without risk. Also owning a portfolio of properties can be complicated and take up a lot of time - especially if you do not live in the same country for most of the year. In the UK, FBN Private Banking has selected a panel of advisers to assist and help clients navigate their way through this often complex area. In addition, Property funds are available as an alternative to owning the asset directly. Details at stand 430. Auction Finance is a provider of short and long term funding solutions. As an established principal lender, their professional team have vast experience in providing fast and flexible funding solutions to keep property purchases on the right track. Almost any property or land in England, Scotland and Wales is accepted as security. Funds can be used on UK or overseas acquisitions, developments or renovations. Endsleigh was originally founded in 1965. Their extensive range of insurance products will cover everything needed in expanding lifestyles, from car, travel and gadget insurance to home insurance, including buildings cover, and even contents cover in shared accommodation. Endsleigh Insurance Services Limited is authorised and regulated by the Financial Conduct Authority. What makes CrowdProperty different from any other peer to peer lending platform, is that their team have years of hands on experience of property investment and development, which means that they have an instinctive understanding of what makes a great property deal. They utilise a robust screening process to ensure that they only give the “CrowdProperty Approved” stamp, to the very best projects and hence “de risking” the investment as far as possible, to ensure safe return of loans plus interest to investors. Nova Financial is an independent & privately owned Buy to Let property advisory company. Being independent is very important to our clients and to us because it means we can objectively source the right investments from the market to specifically suit your needs. We start by analysing your current situation and what you are hoping to achieve. We will then objectively evaluate what type of property investment will help you achieve your goals and provide all of the research and logic required for you to make a confident and educated decision. We provide an end-to-end advisory service and we guide you through the entire process to make property investment easy. Like our ‘New Approach’? Get in touch. M T Finance offer transparent, affordable, bridging finance loans on a ‘Non Status’ basis - that means they don’t require evidence of trading history, accounts, or proof of income. Providing both 1st and 2nd charge loans, their underwriting process has been streamlined to bring cases to a close as quickly as possible and with minimum fuss - often in as little as 72 hours. Best Bridging Finance Company` (The Financial Reporter Awards 2013) visit their stand. Our crowdfunding model groups people together to invest in property. The structure used to accomplish this means you are actually investing in shares in a Special Purpose Vehicle (a limited company called an SPV) that will own the property outright free of any mortgage. We secure under value properties some of which have tenants that are listed on the FSTE. In addition we secure a minimum 8% net rental yield. Our properties are in London, Manchester and New York. Just Bridging Loans is a responsible specialist lender to the UK commercial property sector. They work in partnership with professional brokers, partners and intermediaries offering flexible bridging solutions from £10,000 to £500,000 to growing property businesses. Cash could be needed to complete an existing development, refurbish an existing property or extend the property portfolio. The list is endless. The funding is an alternative to a bank overdraft or normal bridging loan. Stand 122. • Agree funding that fits in with clients’ overall strategy and ownership of the assets. Discuss Residential Investment Finance – and Bespoke’s other services – at stand 422. Kingswood Associates is fully impartial and has specialised in sourcing and arranging Property Development Finance, Buy to Let mortgages and Commercial finance since 1997. They are not tied in with any specific lenders, meaning they are in the best position to offer genuinely impartial advice. Their role is to find the best deal possible for each client. Their size and longevity in the industry allows them to negotiate great deals for clients and gives them access to financial products that many other brokers are unable to offer. Stand 128. Buy to Let Mortgages are for those wishing to invest in residential rental property. Although the perception is that buy to let mortgages are expensive, this isn't necessarily correct. There are many lenders who offer competitive rates, which in many cases are generally similar to the rates offered on a standard mortgage. Landlords also have a choice between interest only and repayment mortgages. Buy to let mortgages do differ in several ways from standard mortgages. When lenders are considering approving a buy to let loan, they generally base their decision on the likely rental income from the property and not necessarily the applicants' income. With their extensive access to thousands of mortgages and our knowledge of lender's requirements, Cherry can find you the right buy-to-let mortgage. Speak to Howard Reuben at stand 168.